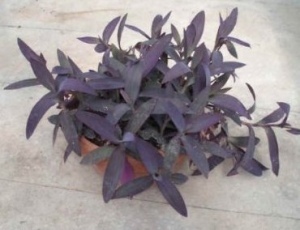 If you've never grown Purple Heart Plant, you may want to add it to your collection. It's in the spiderwort family along with the Wandering Jew plant, and you'll find it's just as easy to grow. T. pallida is also known as Setcreasea purpurea and is sometimes sold under that name. Bunches of rich purple, lance-shaped leaves make this a beautiful house plant year-round. Pot it in a small decorative container for an eye-catching table accent. Or hang it in a basket and let the long, sprawling stems cascade over the side. 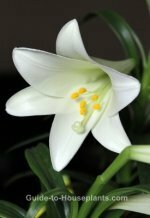 You'll want to handle this plant carefully; its fleshy stems are brittle and may break off. It's a good idea to place Purple Heart plant where you won't brush against it. 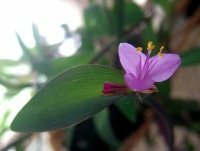 In summer, you can expect small, pink 3-petaled flowers to bloom. They grow in the leaf axils, making a stunning contrast to the dark foliage. You can keep your plant indoors year-round. But if you move it outdoors for the summer, keep it shaded from direct sun during the hottest part of the day. Also, check the soil every couple days so that it doesn't dry out. Let the sun shine in. Grow your plant in bright light year-round for good foliage color. It will grow in lower light, but the leaves will be more green than purple. Give it some direct sun, but shade it from noonday sun in summer to avoid scorching its leaves. Pinch your plant. Pinching off new stem tips will promote branching and keep Tradescantia pallida compact. Don't toss out those cuttings -- you can easily propagate them for more plants. Repot in spring. Move up to a pot only 1 size larger to give it a little room to grow. Use a pot with drainage holes to prevent soggy soil, which leads to root rot. Light: Bright light is needed to maintain the dark purple color. Some direct sun is fine, but keep your plant shaded from strong summer sun. Water: Water thoroughly, then allow the top 1 in (2.5 cm) to dry out between waterings. Temperature: Average to warm room temperatures (65-80°F/18-27°C) suit this plant year-round. Purple heart tolerates varying temperatures with a minimum of 50°F/10°C in winter. Soil: Peat moss-based potting mix, such as African violet potting mix is ideal. Fertilizer: Feed monthly in spring and summer with a balanced (10-10-10) liquid fertilizer diluted by half. Propagation: Take 4 in (10 cm) stem tip cuttings in spring or early summer. They'll root easily in moist potting mix.